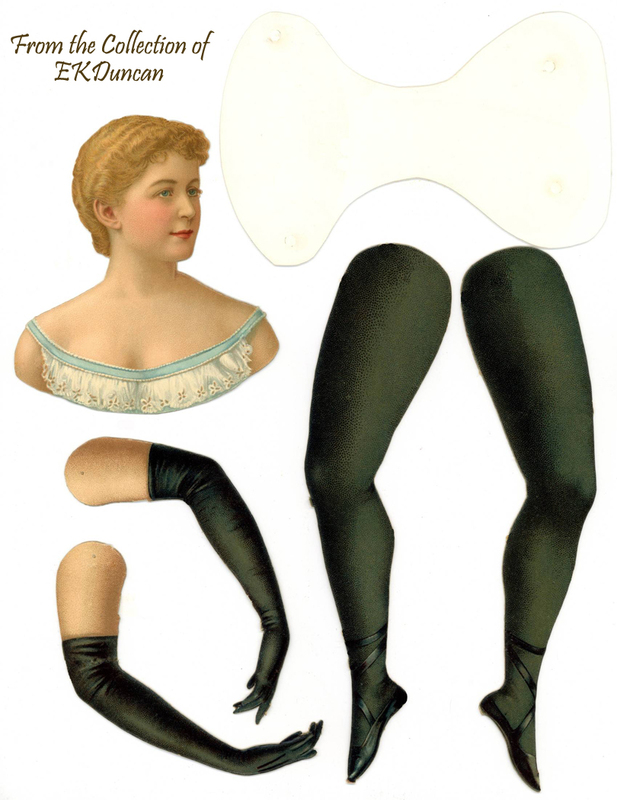 (Littauer & Boysen) would have chosen to use her likeness on one of their paper dolls. 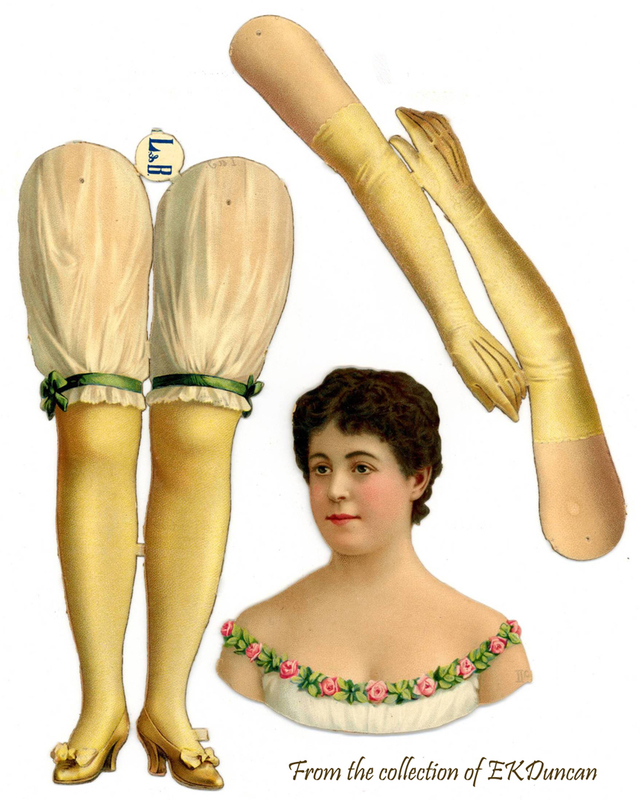 the doll to have full and rounded limbs just as the real lady of the day did. color choices regarding her costume and a new up-do for added interest. 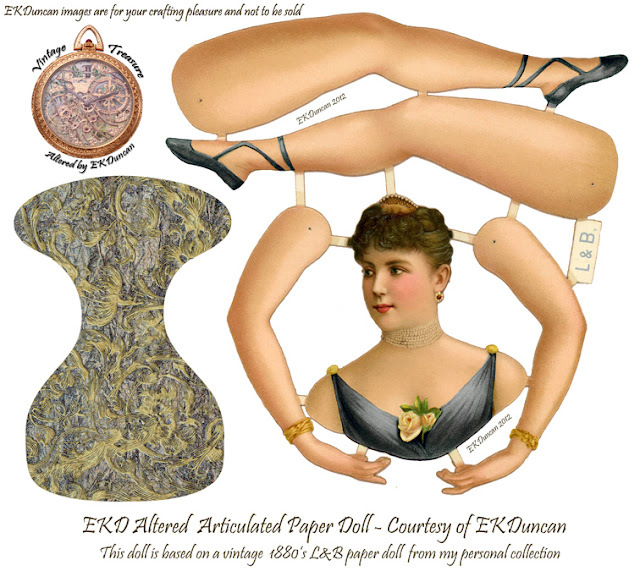 I acquired the original vintage paper doll of Lillian back in 2011 along with the Adelina Patti doll. Both these paper dolls traveled an ocean to reach me, since they were in Australia at the time I purchased them. 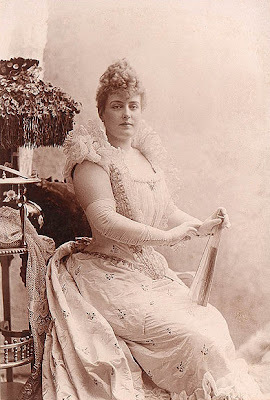 I was especially thrilled to be purchasing a Lillian Russell doll even though she was paired with blue ballet slipper legs rather than the pink ones she should have had. and now I have an authentically correct doll with all the correct parts. she is 14 inches from the top of her head to the tip of her pointed toes. Now that I had all the correct parts for her, I made a new scan to create this image of her. 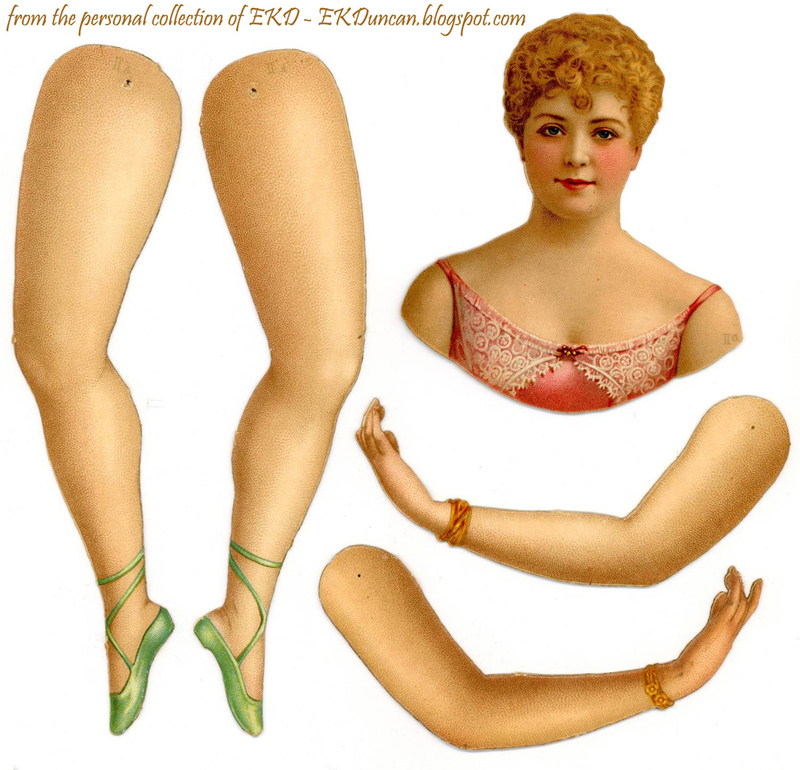 I'm sure you will note the well rounded upper arms and full thighs on this doll. well rounded woman was a thing of beauty, especially with a corseted waist. with it, so it's not unusual that her doll recreates the well rounded beauty in those areas as well. 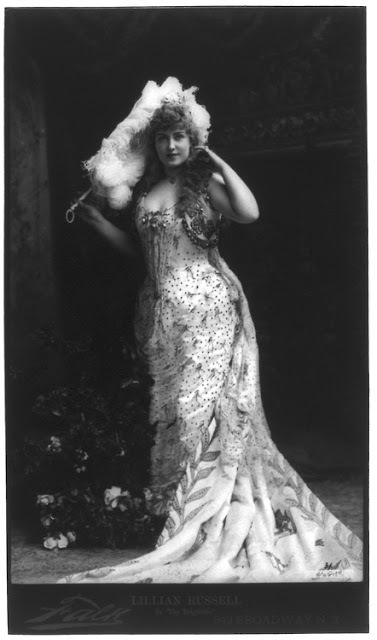 Vintage photos of Lillian Russell - Actress and curvy beauty of her day. Both show her well rounded upper arm quite well. 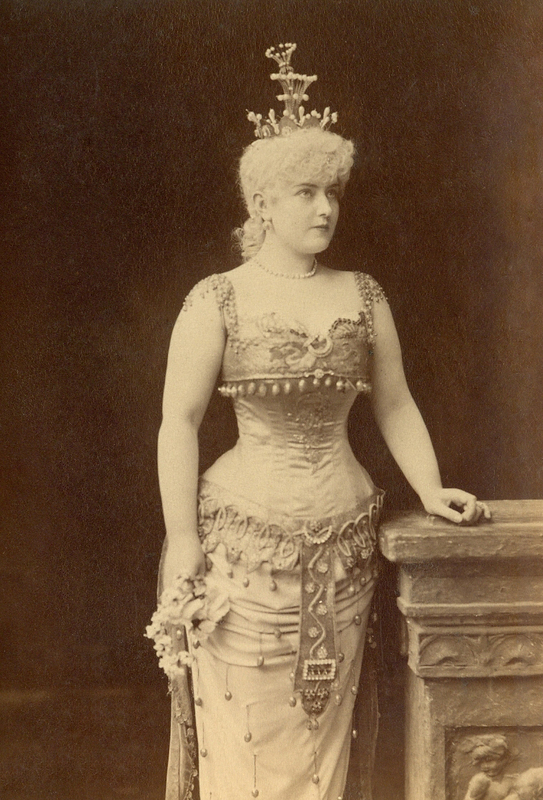 even when her weight reached over 200 pounds. Being a "curvy" girl myself I love seeing vintage photos of the more shapely divas. rounded loveliness of the L&B paper doll that was created to emulate her. so I just added in a bit of an up-do for her. you can easily cut the extra bit away. Either way, she's still a winner in my book. choices to play with. I hope you enjoy the color selection for this altered beauty. I also trimmed a bit off her upper arms, they are still "full" in size but not quiet as large as the original doll parts. I did this so they did a better job of fitting the dolls bodice when she was assembled. Lillian still remains a curvy girl but her pieces are better proportioned for assembly. 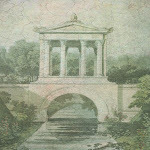 And once more this is the Teal version I started off with at the very beginning of the post. 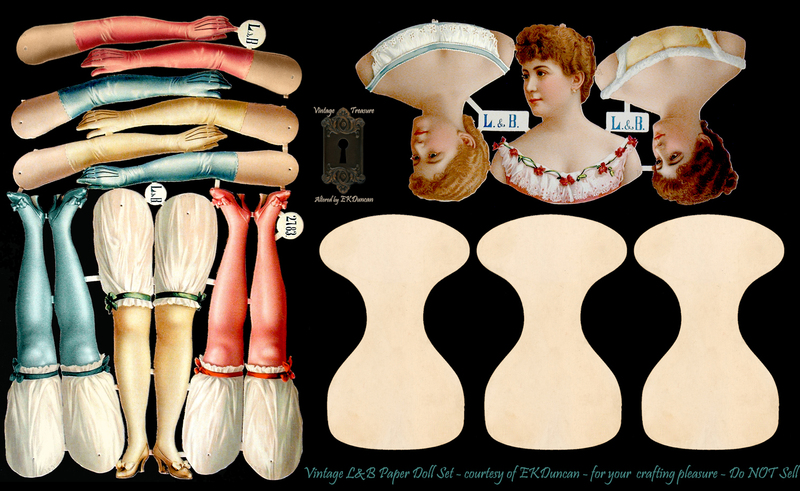 I hope you find these versions of the original vintage L&B Lillian Russell paper doll entertaining and I hope you get a chance to browse the Internet to discover more about the life she led. 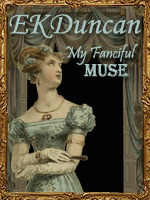 She was a fascinating individual with a very colorful past and it makes for an interesting read. I'll be back soon with another L&B Beauty. This is an adventure your purchase of this beautiful ballerina. I can easily understand your enthusiasm to receive it. It is striking similarity it has with the photo of the actress. I did not know that these ballerinas were based on photos of celebrities. I also love old photos because they have a sweetness that you do not find on the pictures today. 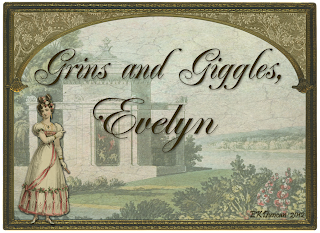 Hi Sylvie - I'm so glad you are enjoying the paper dolls and vintage photos. 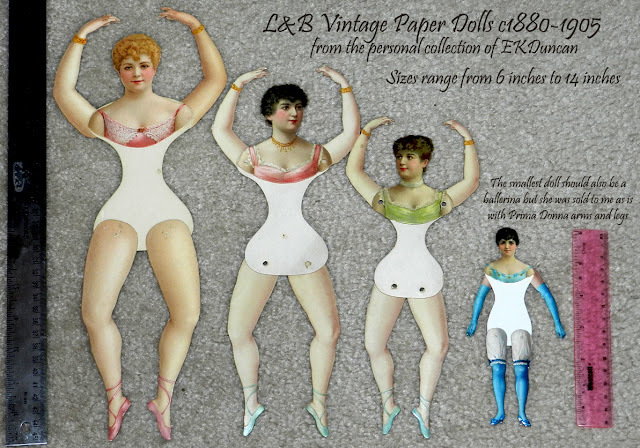 It seems as though celebrities have always increased sales of products, which is why I'm sure L&B created their paper dolls to represent the stars and divas of the the day. 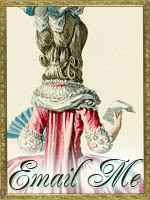 From the late 1800's thru the early 1900's You could find the image of famous ladies on all kinds of items from soap, perfume and candy box labels to cigar labels and cigarette trading cards. I'm sure when the L&B dolls were first produced each and everyone was easily recognizable to little girls and adults the world over, sadly 100+ years later not all of them are so easily identified but there is no doubt in my mind that this doll is the famed Lillian Russell. 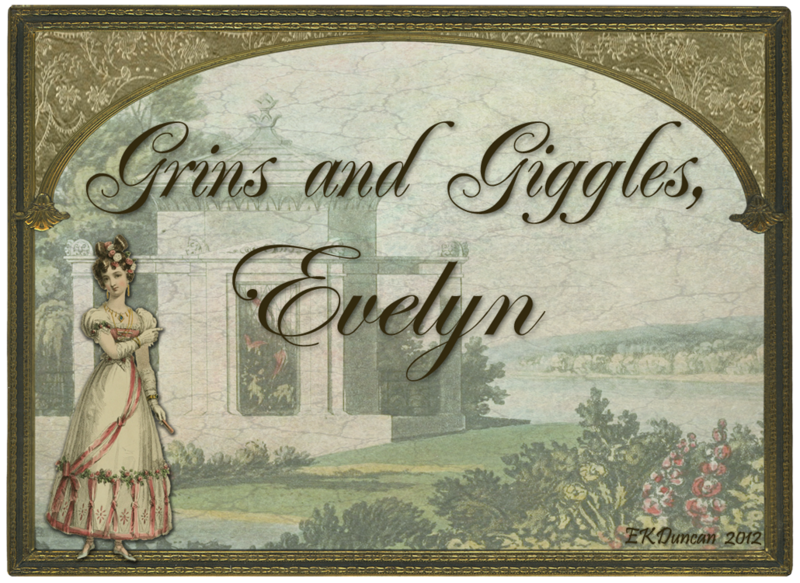 Hi Evelyn! Thank you for this wonderful paper doll pictures. I´m sure, it could be a new love of mine. 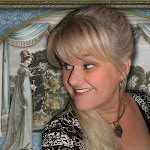 Espescially the beautiful face from Lillian R. and her lovely body are an inspiration to see more of this stunning art. Wishing you a creative fall time! I'm so glad you enjoyed the paper dolls. I have to agree that the Lillian Russell doll has the sweetest face and I love seeing old photos of her. She had a pretty interesting life and I'm thrilled to give her likeness via this paper doll a new fan base.